Noted lawyer Ram Jethmalani today blasted Delhi Police in a case relating to Delhi Police crackdown on Baba Ramdev and his supporters during the intervening night of 4th and 5th June 2011. While arguing for Baba Ramdev’s trust, Jethmalani tore apart claims of Delhi Police that if they had not taken any action, it could have led to the communal tensions in the area. In a hearing which lasted for two hours, the veteran criminal lawyer tried to pursue the judges that Delhi Police violated the provisions of Criminal Procedure Code.Starting his arguments before the bench of Justice B S Chauhan and Justice Swatantra Kumar, Jethmalani said “.fasting and meditation are two elements of Yoga and the word used for fasting is Anshan. Swami Ramdev had declared that he was fasting for a cause of bringing back black money stashed abroad. Up to 3rd of June, Ramdev was a revered personality, not only by millions, but also by the ministers of the Government. Even the Prime Minister complemented him for his suggestions. All that turned out to be hoax and after 4th June Swamy Ramdev became a criminal…”Jethmalani also informed the court that the owner of the property that is Ramlila Maidan is Municipal Corporation of Delhi. According to Jethmalani “..Use of this property doesn’t depend upon the permission from the Delhi Police, they could neither grant permission, nor could they refuse it. There is no rule under which I could be asked to take permission. It is part of the Indian tradition to hold meetings at public places…”Ram Jethmalani informed the court that the Police had imposed three conditions on Baba Ramdev for holding his Yoga camp. These three conditions were (1) You will have to take permission from the owner of the property; (2) Make sure that you don’t obstruct the free flow of the traffic in the area and (3) Depute sufficient number of volunteers at the venue. “…There was no breach of any of the conditions, action of Delhi Police was an act of Criminal Intimidation, it was a show of Criminal Force. Men, women and children were sleeping; Delhi Police own affidavit says that Baba Ramdev himself was sleeping. This crowd went to sleep after the Shanti Paath and they had nothing to do with the traffic. Whoever woke them up is guilty of culpable homicide of the poor lady Rajbala who lost her life.Look at the shamelessness, the records show that the people were injured due to stampede and they did not have Lathis, these are monstrous lies…” argued Jethmalani. Refuting the claims of Delhi Police that Ramdev followers had brought bricks at the venue, Jethmalani said that the bricks were brought for constructions of temporary toilets at the venue. “…the guardians of law who entered to restore the law and order were seen trowing showers of bricks on the Kutia (कुटिया ) of Baba Ramdev. They called us unlawful assembly but in this case, it was the police which formed unlawful assembly…” argued Jethmalani. Concluding his arguments for the day, Jethmalani informed the bench that the police was required to give adequate notice to people before resorting to any action and if the people did not cooperate only then the police could have taken any action. The court posted the matter for further hearing for 4th November. According to Lok Sabha web site, Sonia Gandhi is a trustee of Jaliawala Bagh National Memorial Trust. It seems that she has misunderstood her role. Perhaps, she feels that as a trustee of the “memorial”, she has to repeat Jallianwalla Bagh type atrocities on the Bharatiya people from time to time, so that the “memory” remains alive! May be that is why she ordered that infampus attack on Baba Ramdev and his followers on the night of June 4-5. Jallianwala was perpetrated in 1919 by a foreigner drunk mad with absolute power. Almost 100 years later, history was repeated. Dehradun: As the Government and social activist Anna Hazare continue their war of words, Swami Nigmananda, who had been fasting for almost four months to protest illegal mining and stone crushing along the Ganga near Haridwar died at the Himalayan hospital in Jollygrant in Dehradun on Monday.The 34-year-old swami died at the same hospital where Ramdev was being treated until his discharge on Tuesday.Swami Nigamananda had been on a fast since February 19 this year and was forcibly taken to a local hospital in Haridwar on April 27 when his condition worsened after days of fasting. He was later transferred to the Himalayan hospital in Jollygrant earlier this month after he went into a coma and subsequently died on Monday. “The saint was fasting for the Ganga since the last many days. He laid down his life for the Ganga. 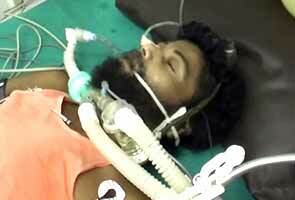 I pay my tribute to Swami Nigamananda,” Ramdev told reporters after he was discharged from the hospital. Swami Nigamananda’s followers have asked for a CBI probe into his death alleging that he was poisoned.